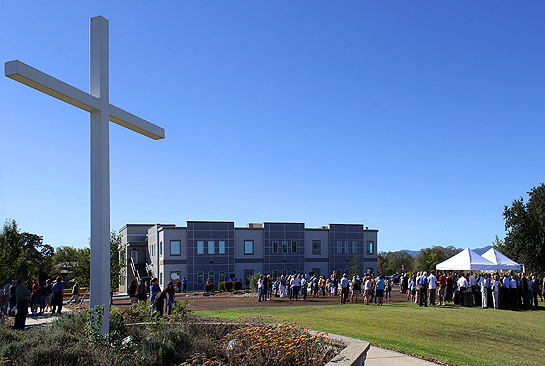 REDDING, Calif. - Community members joined Simpson University employees, students, trustees and friends to celebrate a campus milestone Oct. 3 with the dedication of the university’s new 30,000-square-foot Science and Nursing Center. About 250 people attended the 30-minute ceremony on the northeast side of the building, including U.S. 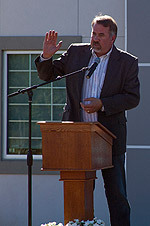 Congressman Doug LaMalfa, pictured left, who took the stage to congratulate the university. 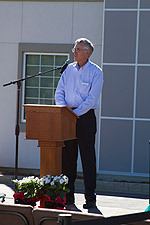 The dedication was part of a weekend celebration commemorating Simpson University’s 25th year in Redding. The university, which was founded in Seattle in 1921, moved to Redding from San Francisco in 1989. The 200-member student body has grown to more than 1,300 in the past quarter-century, and the campus has expanded from three to 13 buildings. The $6.5 million Science and Nursing Center offers much-needed space for classes, lab facilities, and student study and research areas, as well as faculty offices for the Division of Science and Math and the School of Nursing. It includes specialized areas for physics, microbiology, genetics, chemistry, ecology, and anatomy, as well as patient simulation labs. And though the building will be used most frequently by science and nursing students—who comprise 27 percent of traditional undergraduates this fall—“all Simpson students will be served in this building since each major requires science courses,” noted Larry Siemens, assistant professor of chemistry, pictured right. 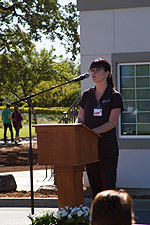 Leslie Woodson, chief nursing officer at Shasta Regional Medical Center, and Kim Shaw, vice president of patient care at Mercy Medical Center in Redding, also spoke at the dedication, noting the increased need for baccalaureate-prepared nurses and Simpson’s partnership with local healthcare agencies. Mercy has already utilized Simpson’s clinical skills labs to conduct required training for its nurses using high-tech manikins. Other speakers included School of Nursing Assistant Director Louann Bosenko, Interim President Robin Dummer, Board Chair Betty Dean, and Executive Vice President Brad Williams. 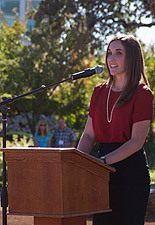 Biology student Leanne Davis, pictured middle left, and nursing student Alyssa O’Connor, pictured bottom right, also addressed the crowd. She and O’Connor both expressed appreciation for all who had donated to help fund the facility. A display in the building’s entry lists the names of science and nursing donors.